A dietary cleanse promises to help you lose weight, look better and feel more energized. Whether the diet carries through on these promises depends on the specifics of the cleanse and its nutritional value. Some deny you whole foods, eliminate entire food groups or require you to consume unregulated supplements. Some cleanse plans are so restrictive that they're impossible to follow for 30 days, and some can even be dangerous for your health. Instead of falling for a fad-diet program with a good sales pitch, design a cleanse around whole, natural foods. These healthy, nutrient-rich foods can boost the function of your immune system and the organs that work to detoxify your body every day. A cleanse promises to reset and detoxify a body constantly exposed to pollutants present in the atmosphere, food supply and cleaning products. Proponents of cleanses argue that only through a strict dietary protocol can you rid your body of harmful toxins. Your body has a built-in program for cleansing, though. Your liver, kidneys, lungs and lymphatic system are designed to keep your body protected from toxins it encounters daily. The issue is whether the body can deal with the load of toxins that it's exposed to in modern society. People who constantly feel bloated, have skin outbreaks, are low in energy or suffer from chronic headaches may benefit from a cleanse. Additives in foods can aggravate or even be the root cause of these symptoms. Before radically changing your eating plan, check with your doctor. Certain foods can affect the function of certain medications; for example, grapefruit interacts with many drugs, and leafy greens block the work of some blood thinners. 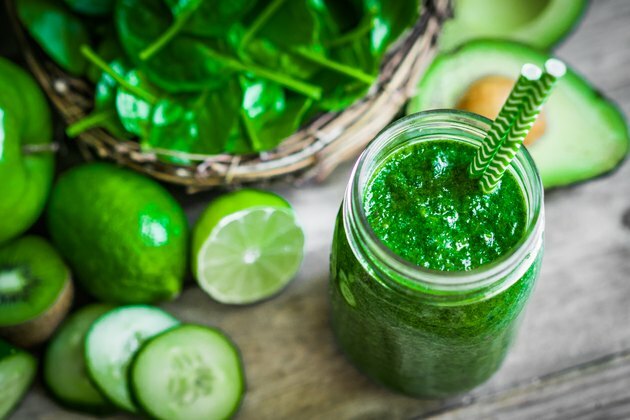 Embark on a cleanse to help you gain energy and vitality, not lose weight at breakneck speed, although weight loss can be a side effect of changing your diet drastically. Don't expect a cleanse to be an instant cure for a chronic condition, either. No scientific research suggests that an extreme cleansing program is necessary or superior to a meal plan that shuns processed foods and embraces whole foods, like vegetables, plain proteins and whole grains. You can certainly lose weight and feel better by removing certain additives, such as chemical colors, artificial sweeteners and refined sugar, from your diet. You'll get rid of unnecessary calories and focus on nutrient-rich foods, making you feel lighter and more energized. A study sponsored by the Milk Processor Education Program and the Dairy Research Institute reported in 2011 that nine out of 10 Americans do not get all the nutrients they need daily. A cleanse based on whole foods helps your nutrient intake improve and, consequently, your feelings of well-being. A cleanse is likely a fad if it makes unrealistic promises -- such as you'll drop 10 pounds in a week. If a cleanse eliminates an entire food group, such as all carbohydrates or fats, or stands by its claims despite serious science negating its validity, it's most likely an unsound fad diet. A healthy 30-day cleanse doesn't require you to skip meals or take proprietary blends of supplements. You may need to make drastic alterations to your way of eating, but you can still shop in a grocery store, eat in a restaurant or have dinner with your family. During the 30 days of the cleanse, avoid foods that come with long food labels, especially with ingredients you can't pronounce. Fast food, frozen dinners, bottled dressings and sauces, energy bars, soft drinks, snack crackers and chips, cereal bars and boxed cereals should be replaced with foods in their natural state. Alcohol and tobacco are also off-limits during a cleanse. Some cleanses prohibit foods that contain ingredients to which many people are intolerant, such as gluten or lactose. If you do decide to remove dairy products or gluten-containing grains such as wheat, ensure you consume an alternative with similar nutritional profiles. For example, if you eliminate dairy, opt for unsweetened, fortified almond or coconut milk to obtain calcium and vitamin D. If you remove gluten, gluten-free grains such as quinoa or brown rice provide you with the fiber you might miss by ditching whole-wheat products. You can also use a cleanse to abstain from eating animal products, such as meat, poultry and eggs. A diet focused on plant proteins instantly reduces your exposure to antibiotics, saturated fats and hormones. Whether you choose this approach is completely up to you. But, if you do adopt a vegan or vegetarian approach, pay special attention to acquiring protein from soy, dried beans, nuts and seeds. Ask your doctor if she thinks you'll need a vitamin B-12 supplement because B-12 is hard to acquire naturally on a vegan diet. Fresh vegetables are perhaps the most important element of your cleanse. Load up on fibrous, watery veggies that provide you with ample fiber to keep your gut regular. Colorful versions, such as green kale, purple eggplant, white cauliflower, yellow squash and red peppers, provide you with antioxidants, flavonoids and other phytonutrients that improve your nutritional intake and fight free radicals, compounds that increase bodily inflammation. You encounter free radicals daily in pollution, plastics and pesticides. A wide variety of fruits, including pears, grapes, apples and berries, should also feature prominently in your 30-day plan. Eat organic when possible, but especially when consuming fruits and vegetables in the "dirty dozen," a group that the Environmental Working Group has identified as the most contaminated with pesticides and fungicides. These include apples, celery, cherry tomatoes, potatoes, cucumbers, grapes, nectarines, snap peas, spinach, strawberries, sweet bell peppers and peaches. Hot peppers and kale or collard greens are also best to buy organic as conventional versions can often be highly contaminated. For 30 days, you'll fill your plate with lean proteins seasoned just with spices, onions, garlic and fresh herbs. Bake free-range chicken, for example, with oregano and lemon juice or broil wild-caught salmon topped with sea salt and pepper. Tofu, raw nuts and seeds, raw nut butter and quinoa are vegan sources of protein appropriate for most cleanses. Minimally processed whole grains, such as millet or quinoa, fit into a cleanse. Season them with garlic, onions and fresh herbs, particularly cilantro, mint and parsley. At first, food may taste relatively plain, but as you progress through the 30 days, you'll learn to appreciate more subtle flavors. By eating a variety of whole foods daily, you'll keep your energy levels up and not feel extremely hungry. Once you get the hang of selecting whole foods, the cleanse becomes easy enough to follow. You may have withdrawal symptoms and cravings as you give up refined sugar and an evening glass of wine, but these usually pass as your body adapts. For breakfast, have a bowl of quinoa topped with berries, almond milk and slivered raw almonds; poached eggs over sauteed spinach with an apple; a smoothie blended with blueberries, avocado, coconut milk, ground flax seed and spinach; or fresh fruit, such as banana slices and pears, dipped in raw almond butter. At lunch, enjoy a large green salad that includes romaine, chopped kale, baby spinach, radishes, shredded carrot, quinoa, walnuts and avocado topped with lemon juice and cold-pressed olive oil; a vegetable soup made by simmering garlic and onion with various chopped vegetables, including fennel, cabbage, zucchini and carrots; or a grilled chicken breast alongside steamed broccoli and wild rice. At dinner, broil fish with lemon slices and serve with a baked sweet potato and steamed asparagus; grill pasture-raised flank steak and serve with roasted winter vegetables; or stir-fry tofu with Chinese cabbage, celery and bell pepper. Squeeze lemon juice or add balsamic vinegar to these meals to punch up the flavor. Snack on a handful of raw cashews, cut-up vegetables, pumpkin seeds or fresh fruit. Use a skin brush to stimulate your lymphatic system and improve circulation, since this helps your body naturally excrete waste. A regular Epsom salt bath, visits to a sauna and deep yoga breathing can also help stimulate your natural detoxification organs. Drink ample amounts of water and herbal tea to keep you hydrated and your kidneys flushing out waste. Consider limiting your exposure to nonfood toxins. Switch to natural cleaning, laundry and beauty products to limit the chemicals to which you're exposed.